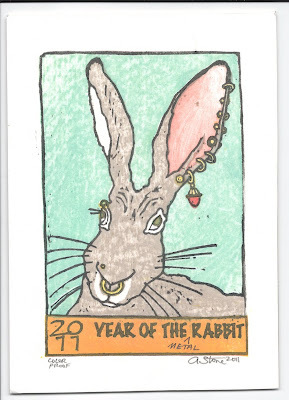 I managed to print 3-4 color variants of my still-unfinished, Year of the Rabbit card. I have the yellow block pretty much squared in and registration was satisfactory, if not perfect. I need to work on the ring over the Right eye and there was some unwanted embossing of the paper where I hadn't cleared the block well enough. 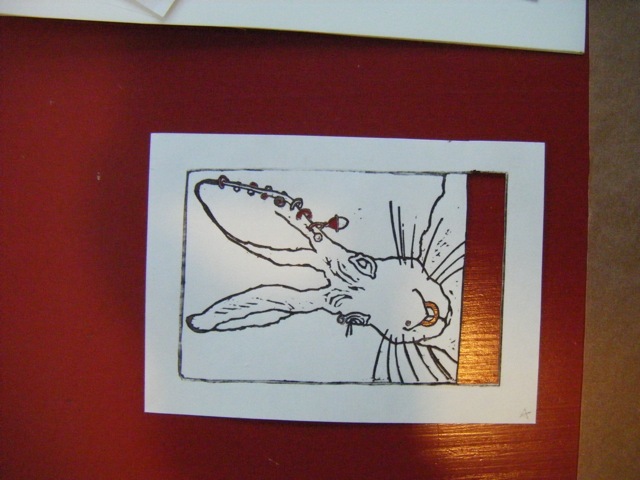 There is still to trim back or shim the red block--the red jewel is a bit out of registration...and there is a little general clean up to do as well on the rabbit block and the keyblock. But I still think I have to play with the colors a bit and I'd like the gold rings to be a bit more visible...I may try some metallic ink. 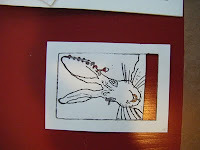 I touched in some gold gouache with a small paintbrush and I liked the effect but would prefer to print it. Sometimes trying to cut corners just makes the path a whole lot longer. I ordered paper for my last print directly from Japan and when I saw that they also offered blocks of small, postcard paper in 4" X 6", 50-sheet blocks I thought it was a great idea. 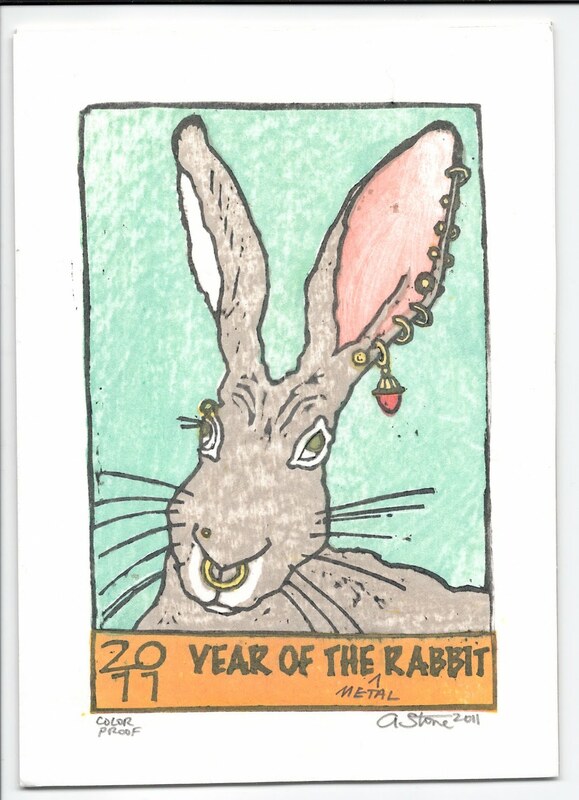 I'm working on a postcard sized print for the Year of the Rabbit. "think of all the time I'll save.....". Then, I needed blocks. I ordered blocks too at 4" x 6" size. Since the paper is already pretty small, I'll print right to the edges so I don't waste any paper. "think of the money I'll save on smaller blocks and I won't waste any wood or paper scraps....."
Usually I carve my registration system into each block using the traditional kento system of corner and edge stops that are part of each woodblock. 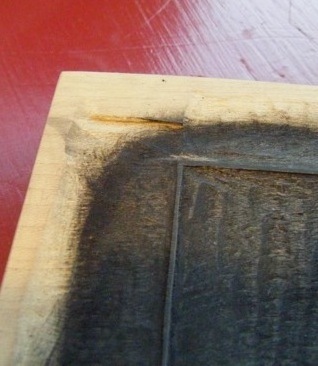 This is a traditional kento system of registration:Here is the corner stop or "kagi kento"
The corner kento is carved in a lower corner of the block and the corner of the damp paper would normally seat into this to line up each time it was printed. 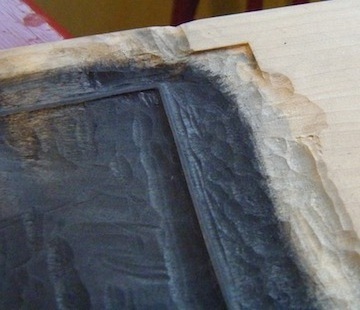 Another straight edge is carved to catch the lower edge of the paper; this is instead the line stop or lower edge stop called the hikitsuke kento. Together, the pair of these carved niches allow very precise registration of multiple colors and multiple impressions. You can place the paper down EXACTLY where you want it using this system. SO, I had to make a little jig, that would hold the blocks still and allow me to lay the paper down evenly. 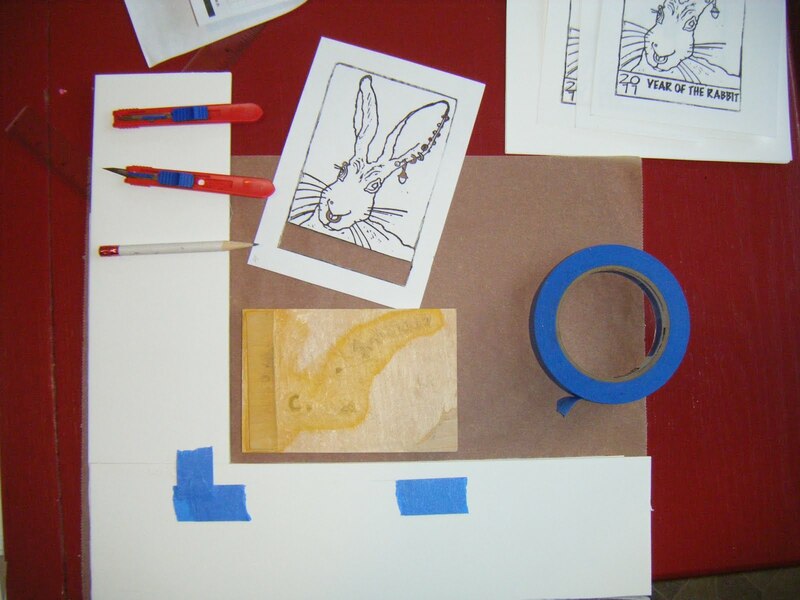 But the kind of jig that allows me to place a piece of damp paper directly down on a block of the same size just isn't accurate enough for the print I'm planning so, I had to abandon the first jig, build another, I go out and cut paper 5" X 7" so I'll have enough border to work with. But, as my blocks came from two different sources and are different heights, the slight difference in height meant the thinner block was harder to control in the jig and ended up printing off-register from the rest which I figured out with the first full-color proofs when my yellow color printed way off. I've spent the last two days trying to fix it. Today I finally broke down and made a SECOND jig for the yellow color, wrong-sized, off-register block. I printed a black copy from my key block using Jig 1 on dry paper. 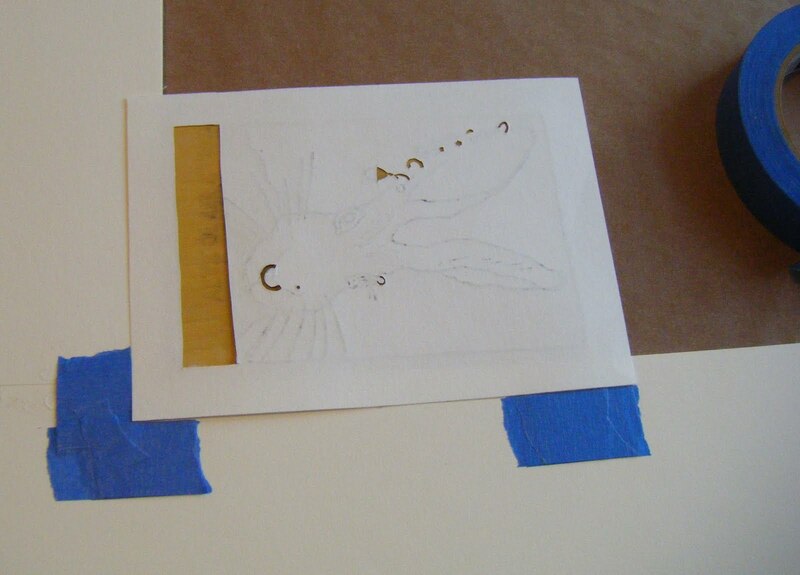 Then, using a small blade, I cut out the small parts that will print off my yellow block. 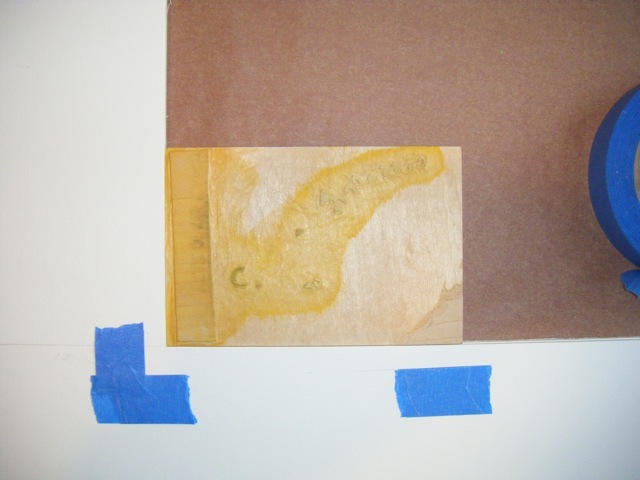 Then using the new jig, I placed the yellow block in it, and placing the printed copy on top and peeking through the holes, I could line up the cut out with the corresponding raised portions of the carved block and the edges of the paper will now demarcate where to place my new registration marks for the yellow block. I used blue painter's tape instead of cutting into the foam board I used so I can move them if necessary after proofing. Tomorrow I hope to reprint a color proof to see if they now all line up. planning on using paper a bit bigger, carving blocks on boards a bit bigger too, and trimming down to size afterwards just accepting that there will be some "waste" paper and wood but a huge savings in labor, time, energy and precision.